2015 became a milestone for sustainability by being the year in which governments agreed to adapt a new agenda for development post-2015. The new agenda is transformative, centered on people and has bold and ambitious goals. 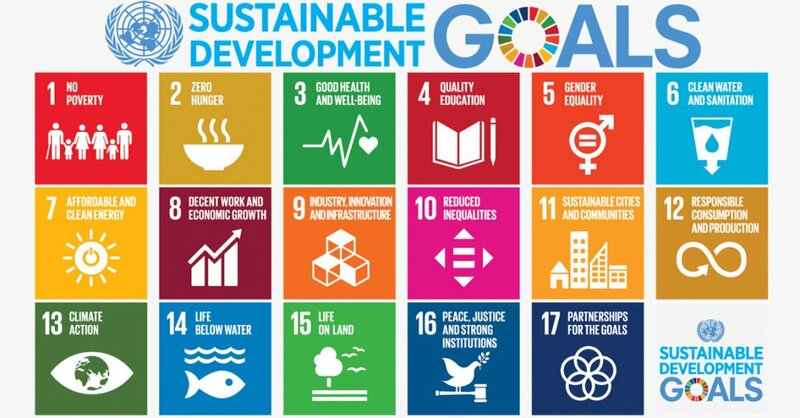 The Sustainable Development Goals (SDGs) that take and expand the Millennium Development Goals (MDGs), whose application concluded in 2015, consist of 17 goals and 169 targets and will be the framework for the new global agenda of development for the next fifteen years. 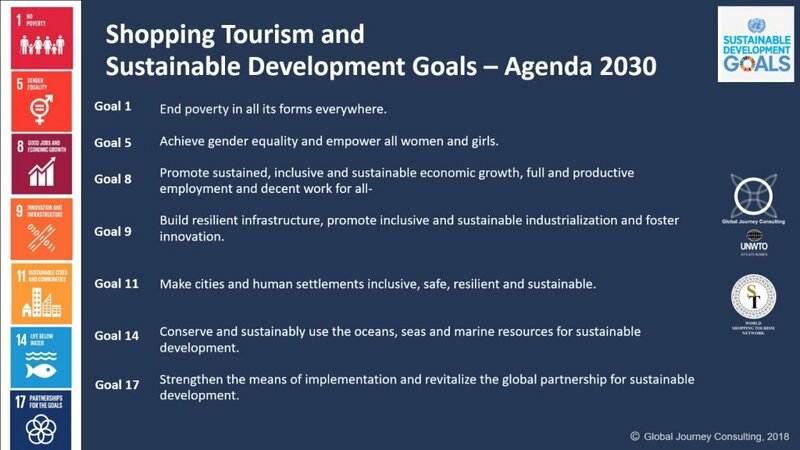 Tourism can, directly or indirectly, contribute to all these goals. Tourism specifically appears in the targets of goals 8, 12 and 14, which are, respectively, related to inclusive and sustainable economic development, sustainable consumption and production and sustainable use of the oceans and marine resources. Therefore, sustainable Tourism is firmly positioned in the agenda for post-2015 development and a clear implementation framework with adequate financing and investment in technology, infrastructure and human resources is necessary. In this sense, Global Journey Consulting and the World Shopping Tourism Network have had a vocation in the development and fulfillment of the Sustainable Development Goals 2030 proposed by the United Nations – World Tourism Organization. The World Shopping Tourism Network (WSTN) is an initiative that surges in the year 2015 thanks to the effort and leadership of important Affiliated Members of the World Tourism Organization and other international institutions, and is managed by the international company Global Journey Consulting. The WSTN is based on an online platform (www.worldshoppingtourism.com) and is currently formed by important institutions, international companies and educational centers around the world related to tourism, trade and other sectors related to Shopping Tourism. The members of the World Shopping Tourism Network work in distinct sectors and activities due to the transversality of Shopping Tourism, mainly with fashion brands, retail businesses, accommodation, restaurants, transport, etc., as well as with other types of tourism such as tourism of events and congresses (MICE), cruise ship tourism, cultural, business, religious, etc. and the important involvement of universities and educational centers because in all types of tourism that we know the traveler-tourist has the deep desire to take something from the visited place with them, whether for the own enjoyment or to gift others. Focused on the offer of brands known on both an international and national level, localized mainly in commercial centers and emblematic streets of some cities. New vision that integrates the local industries of a territorial space within the concept of Shopping Tourism and its international promotion of the cultural values of the territories. This type of Shopping Tourism allows to offer the traveler a unique and different experience to get to know and acquire products elaborated only and exclusively in that tourist destination, whose Cultural Identity is characteristic of that territory, as well as the promotion and stimulation for the creation of culturally appropriate and locally belonging approaches and processes, inspired by the principles and values inherent to Sustainable Development 2030 as the fundamental value of tourism. Revalorization of ancestral creative techniques, relating the Tourism offer of the territory with the traditional and contemporary local industries, handicraft, tradition and popular culture. Development of differentiating experiences. Social and economic development of the territory by putting local professions and products deeply rooted in the Cultural Identity of the territories into value through the development of new techniques and clean, ecological and sustainable technologies, their promotion to travelers and tourists and a centralized offer of this type of products. Creation of new tourism offers while creating new commercial networks that at the same time allow to develop and/or enhance the employment opportunities, supporting the social improvements in the territories while these industries are being modernized, especially handicraft to have it adapt it to new information and communication technologies without losing the authenticity and the values of these activities. Accessibility of Tourism and products with cultural identity for people with disabilities. Accessible Tourism or Tourism for All within the offer of Shopping Tourism with Cultural Identity, not only limited to the elimination of physical, sensory or communication barriers, needs to be highlighted, reaching that the touristic environments, products and services can be enjoyed in equal conditions by any person with or without disability. Competitive insertion in the global markets, social inclusion and environmental sustainability of the territories whose tourism offer allows for a flow of tourist attracted by the tourist resources and the particular local productions of the Territory. Empowerment of women and affirming that gender equality is a prerequisite for Sustainable Development in the Territories. Economic and cultural integration in a global world while avoiding seasonality due to the tourist action related to Tourism of Purchases of Products with Cultural Identity can be done at any stage of the year, at least for products that don’t depend on a determined season as gastronomical ones may. Development of useful solutions in territories where social, economic or cultural conflicts exist and opportunities of inclusion of vulnerable communities are generated through the creation of new job sources in the touristic and cultural area. Goal 8. Promote inclusive and sustainable economic growth, employment and decent work for all. Goal 9. Build resilient infrastructure, promote sustainable industrialization and foster innovation. Goal 17. Revitalize the global partnership for sustainable development.